the baby was on the verge of drowning and facing imminent death if someone did not act swiftly. Without thinking twice, someone promptly aborts everything to jump into the river and save the baby. Everyone’s heart had been racing in panic and confusion, rush to ensure the baby is safe. Just as things start to calm down, they notice another screaming baby in the river. Again, someone jumps in to pull the baby to safety. from the stream, ensuring they were properly fed, clothed, housed, and integrated into life of the village. While not every baby could be saved, the entire village spent all their day trying to save as many as possible. As everyone kept busy in the recovery efforts, two townspeople started to run along the shore of the river. This parable explains the modern industry of human services. Another version would include someone jumping into the river and teaching the babies to swim. While it is fair to say that everyone in this situation is doing their absolute best to fight the problem, real change is only going to happen once we find out the core problem to eliminate more from falling into the river. Is there some mysterious illness in these children? Had the shoreline been made unsafe by a natural disaster? Was some hateful person throwing them in deliberately? Or was there an even more exhausted village upstream that had been abandoning them out of hopelessness? Just like with addiction and mental health, we can fix all the presenting symptoms, but there will never be long-lasting change until we can get to the root of the problem. Everyone is innocent and pure at their core. “She just pops them out and then we end up paying for them,” complains a clinician during a staffing session at a mental health facility. “She just does this to get more drugs,” cries another in agreement. Without any background, experience, or education in this industry, any group of outsiders could unanimously agree that this behavior is not “normal.” But the behavior and actions are not the questions we need to ask in this industry; rather, the question should center around what is leading to this behavior? Is it a choice? Is she just a bad person? Would anyone, with a rational mind, “choose” to intentionally penetrate a sharp blade through their midsection just to score some drugs? Does anyone truly believe that jamming a knife in your stomach is the best available option? This “choice” theory is still largely, and openly, debated in society. Despite the immense volumes of advanced evidence of addiction and mental illness, the stigma survives. The medical and scientific communities have proven these diseases through a plethora of research, studies, brain imaging technology, along with the work of the top neuroscientists in the world. Yet, the public disagrees. Shall we debate whether or not the earth is round, the rotation, and how it orbits the sun? Shall we debate how fish do not need to be immersed in water to survive and that is their choice? Why, as a society, can we not accept the overwhelming evidence regarding mental illness and substance abuse? This stigma we create and support is preventing people from receiving their inalienable human rights. I remember this woman’s funeral quite well. Her adult children all arrived from out of town, had not been around for years, but made their grand entrance for the spectacle. You could sense the anger and negative energy in the room. “She is going to burn in hell,” was the common theme among these kids who had not seen her in years and never really took a peek behind the mask. They never really knew their own mother. They were all in foster care before they were five years old, but made an appearance at her funeral to wish her well spending eternity in flames. But the oldest daughter always stuck around, caring for her mother as she watched her slowly drink herself to death. Continuing to care for her mother, no one quite understood what made her return day-after-day and take on the abuse. They questioned her mental stability, courage and strength. Every day, people would expect her to stop showing up, stop caring, stop loving and stop trying. She saw something no one else saw. And if you haven’t been there before, there are no words in the world that can be said to make you understand. And if you have been there before, no words are needed and you already fully understand everything. There is no storybook ending. The woman died without ever saying goodbye. But, this woman did get what she always desired—to believe she was a good, worthwhile human. She had finally received her life, liberty and pursuit of happiness. This woman finally felt loved for the first time in her life during the last few years. While the daughter may not have noticed this new unconditional love was reciprocal, I did notice. And it changed me forever. I saw it in the mother’s eyes and I know the daughter was right all along. I needed it. Now, remember, my grandmother is this same, nasty old drunk I’ve been talking about for the past few pages, but she saw that I truly needed to have this football. That was my Grandma. And the oldest daughter was my mother. I love you Grandma. Mom, you are my hero. Taking the Mask Off” is the new book by Cortland Pfeffer and Irwin Ozborne. Cortland Pfeffer spent years as a patient in psychiatric hospitals, treatment centers, and jails before becoming a registered nurse and working in the same facilities. Based on his experience, this story is told from both sides of the desk. 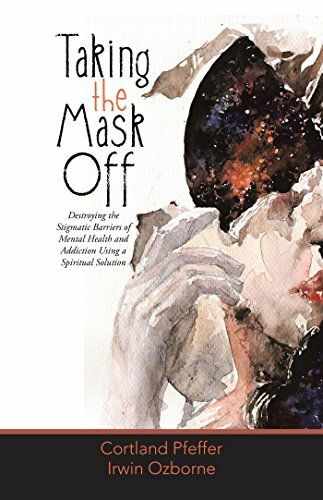 It offers a unique and valuable perspective into mental health and addiction, revealing the problems with the psychiatric industry while also providing the solution – one that brings together science, spirituality, philosophy, and personal experience. I couldn’t hold back my tears. Very inspiring article! It’s so easy to type-cast those who don’t fit into society. For now, I have to unmask the ‘Monsters’ in my life. Thanks for sharing. Thank you for posting it. Meaningful, deep and beautifully written post full of wisdom . The whole duty of man is to love your neighbour as yourself. Hugs. My mother was addicted to pain meds and antidepressants most of my childhood. She passed exactly two weeks before my first son was born. But she was so good to me, loved me so much. Both her parents were alcohlics and she had been passed around among her family like an unwanted stray dog. That she became as strong as she did for as long as she did was a testament to fortitude in my young mind. Though I fight co dependancy as a result, she was always honest about her life and that helped me to understand. We are all broken in some way. Some of us just can’t find the strength to mend our hearts completely. Thanks for sharing your story. It’s tragic and beautiful. And it’s true, we seldom get to see the formation of people, their emotions and motivations, only the behaviors and habits. My grandparents were (except mum’s mum) alcoholics. But they loved me and I loved them back. They almost never said a cross word to me, even when I misbehaved. And I never really learned much about why they were alcoholics or what their parents did to them. But I watched mum and dad deal with their parents and serving them. They are still strong examples to me. Thank you for posting this. GUYS I JUST wrote a blog entry about alcohol and drugs plz check it out! Wow, this is incredible. And I can 100% relate. Love is a very powerful thing. Seriously. Bravo. Snaps, and claps for you, my friend! There is no denying the suffering brought by addiction. My mother was an alcoholic for years and stopped when she knew she was pregnant with me. Growing up I couldn’t understand how my older brothers resented her so much. Until I found out through my sister that they all had to go to foster homes. They said when I was born I saved our family cuz Moms got all her children back but one. We should never judge others because we don’t know what’s under their mask or what they are recovering from. I firmly beleive behind ‘poor choices’ addictions and so many other ‘unsavory’ things is pain. so much pain. some people just need someone to love them enough to face it together and get past it, unfortunately others will never make the choice to face the pain. it is mystifying to me why some will and some won’t. I’m sure there isn’t a single answer to that question.